Zero Waste: Reality or Fantasy? With more companies and communities diverting waste from landfills, incinerators and waterways, could a zero-waste planet be possible someday? Read more about Zero Waste: Reality or Fantasy? (3BL Media/Justmeans) The burning of fossil fuels has increased the concentration of carbon dioxide in the atmosphere. Shipping companies like UPS are investing in renewable natural gas (RNG) as an alternative to fossil fuels. RNG, also known as biomethane, is a gas that is completely interchangeable with conventional natural gas, and can be used in natural gas vehicles. (3BL/JustMeans) Carnival Corporation is a cruise company that bills itself as the world’s largest leisure travel company. It is also a company that puts a premium on sustainability, as shown by the progress it has made towards sustainability performance goals it set in 2015. The 10 goals are all specifically designed to reduce the company’s environmental footprint. (3BL/JustMeans) JPMorgan Chase has a big global reach. It has offices and operations in over 60 countries in more than 5,500 properties that cover about 75 million square feet—about 27 times the square footage of the office space in the Empire State Building. When a company that big announces new environmental sustainability goals, it has an impact. (3BL/JustMeans) When you are the leading integrated energy company with a firm commitment to sustainable energy, announcing a new plan to transform your business might shake up stakeholders. NRG Energy is that company, and its recent announcement of its transformation plan caused some stakeholders to query the company about its commitment to being a sustainable energy company. (3BL Media/Justmeans) – The World Economic Forum is now in its 47th year. It’s famous for its annual summit in Davos attended by luminaries in multiple industries. But It is also known for selecting and bringing together a yearly community of over 800 Young Global Leaders (YGL)—enterprising and socially-minded men and women, all under the age of 40. 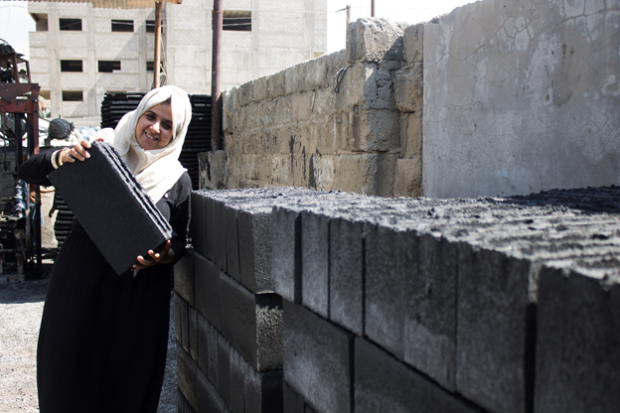 (3BL Media/Justmeans) – Two women engineering graduates from the Islamic University of Gaza are defying stereotypes by making eco-friendly bricks out of war rubble in the area. They are doing something creatively progressive by marrying construction with sustainability: these building blocks are now being used to rebuild homes for those who have lost their houses in the troubles. (3BL Media/Justmeans) - For those who care about the environment and social justice, the election of Donald Trump is a shock. Some of have wallowed in despair, while others entertained thoughts of leaving the country. By now, most should be thinking about what can be done to fight for what we believe in.